Images clockwise from top: British firefighting trio in 1927 via Bettman/Corbis; woman inspecting wellingtons of Auxiliary Fire Service in Manchester, England, 1939; New York Times article dated Feb 8, 1884. 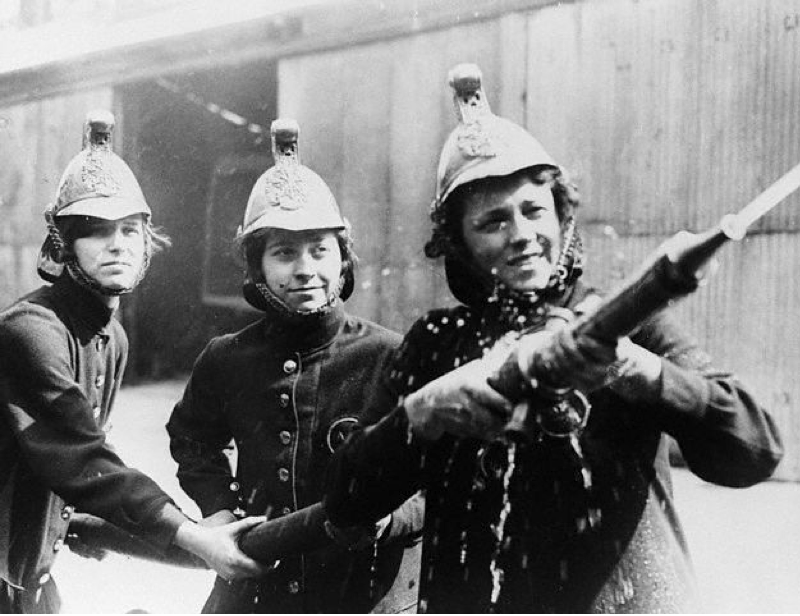 In the 1880s, a women's college outside of Cambridge, England formed their own fire brigade after a nearby haystack fire. The Girton College fire brigade remained intact until the 1930s when they became in range of the Cambridge fire trucks. They made national news when The New York Times praised the force in 1884, but just four days after the article was published, a men's college in Cambridge, Massachusetts published a follow-up that was quite skeptical of the female firefighters. 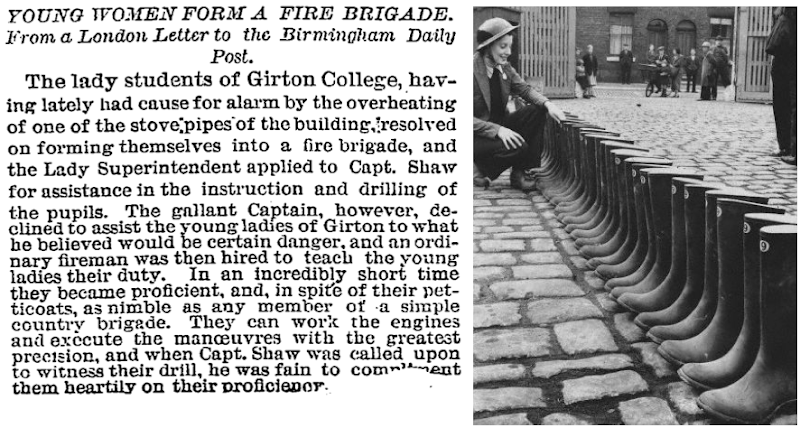 "The truth is, the duties of a fireman and a lady are entirely incompatible, and it is not creditable that the Girton girls have resolved to imitate the typical fireman. What they have probably done is this: They have formed a young ladies' fire company. They wear a pretty uniform, with feathers in their hats and flowing sashes of pink ribbon." —an excerpt from The Harvard Crimson, 1884. Way to go Harvard. LOL. this is amazing, I only wish I could have joined them!! You've got to love a posh British bird! But what I really love about this is the use of the word "fain". I'm going to start using it in my day-to-day conversation now.